This question is not so much programming related as it is deployment related. I find myself conversing a lot with the group in my company whose job it is to maintain our production Windows servers and deploy our code on them. For legal and compliance reasons, I do not have direct visibility or any control over the servers so the only way I can tell which version(s) of .NET are installed on any of them is through directions I give to that group. So far, all of the methods I can think of to tell which version(s) are installed (check for Administrative Tools matching 1.1 or 2.0, check for the entries in the "Add/Remove Programs" list, check for the existence of the directories under c:\Windows\Microsoft.NET) are flawed (I've seen at least one machine with 2.0 but no 2.0 entries under Administrative Tools - and that method tells you nothing about 3.0+, the "Add/Remove Programs" list can get out of sync with reality, and the existence of the directories doesn't necessarily mean anything). EDIT: In the absence of a good foolproof intrinsic way to do this built into the Framework(s), does anyone know of a good, lightweight, no-install-required program that can find this out? I can imagine someone could easily write one but if one already exists, that would be even better. The site has a script that looks your browser's "UserAgent" and figures out what version (if any) of the .NET Framework you have (or don't have) installed, and displays it automatically (then calculates the total size if you chose to download the .NET Framework). You can programmatically check the registry and a few other things as per this blog entry. ...and right-click / go to the version tab for each result. If you want foolproof that's another thing. I wouldn't worry about an xcopy of the framework folder. If someone did that I would consider the computer broken. The most foolproof way would be to write a small program that uses each version of .NET and the libraries that you care about and run them. For a no install method, PowerBasic is an excellent tool. It creates small no runtime required exe's. It could automate the checks described in the MS KB article above. Use this "good, lightweight, no-install-required program"
If the machine that you want to check has the .NET SDK installed, you can use a SDK command prompt and run the program CLRVer.exe. The official Microsoft answer on how to do this is in KB article 318785. OneTouch deployment will do all the detection and installation of pre-requisites. It's probably best to go with a pre-made solution than trying to roll your own. Trying to roll your own may lead to problems because whatever thing you key on may change with a hotfix or service pack. Likely Microsoft has some heuristic for determining what version is running. Flawed, because it requires the caller to have registry access permissions. I think Microsoft should have done a better job than this. Article ID: 318785 - Last Review: November 7, 2008 - Revision: 20.1 How to determine which versions of the .NET Framework are installed and whether service packs have been applied. 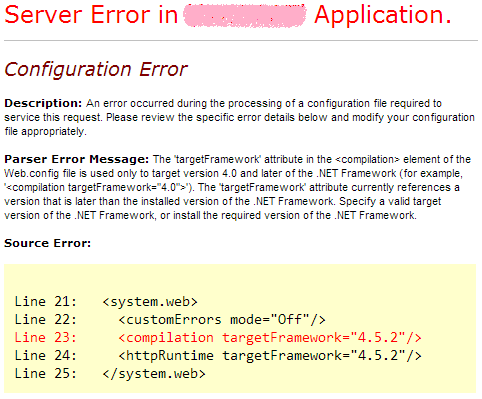 So in this case, my target server doesn't yet support .NET Framework 4.5.2. // Checking the version using >= will enable forward compatibility. Strangely enough, I wrote some code to do this back when 1.1 came out (what was that, seven years ago?) and tweaked it a little when 2.0 came out. I haven't looked at it in years as we no longer manage our servers. It's not foolproof, but I'm posting it anyway because I find it humorous; in that it's easier to do in .NET and easier still in power shell. Well, like Dean said, you can look at the registry and do what he did. To check if he really has CLR .NET Framework installed, you should look for the MSCorEE.dll file in the %SystemRoot%\System32 directory. It is probably a nasty way to find versions out, but I was always under the impression that all version got installed to <root>:\WINDOWS\Microsoft.NET\Framework. This provides folders with names such as v2.0.50727 which I believe give detailed version information. Then the console result will tell you which versions are installed and available for use with your deployments. This code come in handy, too because you have them as saved solutions for anytime you want to check it in the future. I went into Windows Update & looked at the update history, knowing the server patching is kept up-to-date. I scanned down for .NET updates and it showed me exactly which versions had had updates, which allowed me to conclude which versions were installed. Not the answer you're looking for? Browse other questions tagged .net windows deployment or ask your own question. Is there a way to determine the .NET Framework version from the command line? Will the next Windows Server support .NET 2.0? Are all .NET framework versions included in new windows versions? How to reliably detect the actual .NET 4.5 version installed? .NET always installed and enabled on Windows 10?